Ashley Potts | Colorado Eagles Komets defenseman Jason Binkley, middle, holds onto the Colorado Eagles' Shawn St-Amant as they race for the puck in the corner at the Budweiser Events Center on Wednesday, as Fort Wayne's Mason Baptista, left, chases in Game 7 of the Western Conference finals. LOVELAND, Colorado – OK, let me be clear on this. What Dennis Kravchenko did in overtime was absolutely a penalty. And full disclosure, it’s right in front of my vantage point, so I had a better look at that than whatever had just happened at the other end. But given that Michael Houser was similarly bowled over earlier in overtime, I just don’t see the need for the referees to inject themselves into a Game 7 like that. That being said, if you take a penalty in the ECHL, you have to know this is a possibility. If you have a two-goal lead in the third period of a Game 7 and you lose the game, no matter how many wacky circumstances led to it, you have yourselves to blame. So maybe we can write off the Matt Garbowsky goal to bad luck. But not a Joey Ratelle goal and an overtime goal on a power play. That’s a lot of bad luck. The Komets coughed up Game 7, lost 4-3 in overtime. 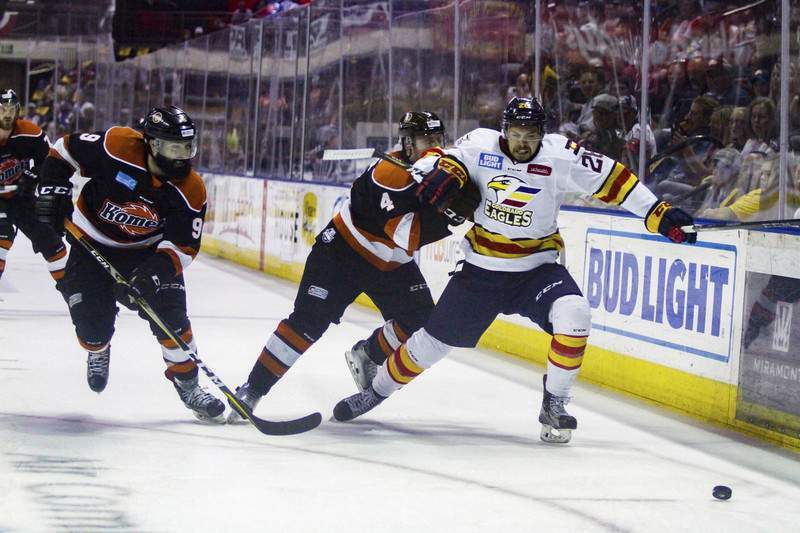 The Colorado Eagles weren’t as good a team overall as the Komets – I can say that because the Eagles were outplayed in 6 of 7 games – but they had more moxie because they won all three overtime games and they took the series. Maybe it’s not a just outcome, but who said sports are about justice? I do think the Komets were sitting back a little bit too much with the two-goal lead, but I also get it. They were missing one of their best defensemen, Ryan Culkin, and facing a team that was just looking to cherry pick the long pass. So it wasn’t the worst game plan. I can hear some of you already calling for coach Gary Graham’s head. I personally don’t see how you can blame a coach who got a team to play well above itself for most of the playoffs – remember those injuries? – and then blame him for this. General manager David Franke has already told me he wants the entire coaching staff back. He also wants the affiliation with the Arizona Coyotes back. This could be a long summer.